Another change was that my character Maris used to be called Ren. She was Lily's foil. I had to change her name when I was reading another author's book where two major characters were named Ren and Lily! What were the chances??? Oy. On the shores of Lake Superior, just north of Bayfield, Wisconsin, there is a wayside rest with a small cinderblock outhouse, nearly obscured by the underbrush. A message is scrawled on the wall in black permanent marker. People come here to see it. They trace the inscription with their fingers, lay their palms against the wall. They imagine her leaning in as she wrote. My name is Lily Hancock. I'm telling you this in case you have to identify my body. Tell my parents I'm sorry, but a promise was meant to be kept. Now all I need is luck. And they wonder if she'll ever be found. "Why don't you introduce me to your friend, Lily?" her mother called. She smiled and lifted a hand, coaxing them over to her. As they got closer, Calder suppressed surprise at finding Mrs. Hancock sitting in a wheel chair. "How was work, Lily?" Mrs. Hancock called. "Is that Calder, too? Our hero!" She smiled and lifted a hand, coaxing us over to her. As we got closer my pulse raced. I didn't know if it was because Mrs. Hancock was sitting in a wheel chair--Had she been that hurt when fell in the kitchen?--or because there was something about being so close to a mother. Any mother. Carolyn Hancock's face softened when she looked at me. Or was I imagining that? Was wish fulfillment another symptom of prolonged abstinence? Was I becoming delusional? Telling the first installment of the LIES BENEATH series from the point of view of cold-blooded merman with guarded speech was a huge risk. How does a reader sympathize with that kind of character? Letting the reader into Calder's mind, showing his most intimate thoughts about love, guilt, and the loss of his family was the only way to make that happen. Hence, the point of view had to change so the reader could watch Calder's evolution from animal to man. I hope you will agree that it was the right decision! 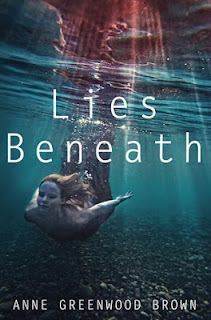 Anne is giving away (2) SIGNED Hardcover Copies of Lies Beneath + Bookmark! Interesting post! And yes. Usually mermaid/merman novels come from the POV of humans. But I like how the author decided to switch it to the lethal merman's POV. Looking forward to reading this! I love the sound of this book (I love mermaids!) Thanks for the giveaway! This book sounds brilliant. I love anything to do with mermaids! its definitely high on my TBR list! I read this one and I quite like it. So a signed copy would be great ^^ Thaaaanks! Excellent post! Reading some many fab reviews on this one! Really want to get a copy myself! Not sure when I can read it though since I am so behind on many 2012 books! But I am so loving the mermaid theme that is getting big! Thanks everyone for all the comments. I hope you enjoy it! I love mermaids!!!!!!!! can't wait to read this book!! I love mermaid books. They've become sort of an addiction for me! Thank you for the giveaway opportunity! Thanks for the inside scoop!! The premise for this one is really alluring. I'm not a huge fan of fantasy novels or mermaid novels, but one of my friends had the 0pleasure of reading Lies Beneath and she guarantees that I'll love it. The plot sounds interesting, and the more I read about it, the more I'm intrigued. I'm definitely adding it to my TBR. Thanks for the giveaway. The excerpts were awesome! Thank you! And Fish and Chicks? HILARIOUS!!!! Thanks for the opportunity to win and read this, can't wait to sink into it, i've read many good things about it. So can't wait to read this one! <3 It sounds absolutely AMAZING. Thanks soooooooo much for the giveaway bb! Wow! There is quite the difference between my emotions reading 1st person vs. 3rd person. I do have to agree that I love the beginning in 3rd person, however; it's very chilling. I reaallllyy loved this book! It was sooo good! Thanks for doing the giveaway! I'm not into mermaid books at all, but this one really captured my attention! I see I'm not the only one either. Thanks for the giveaway - I'll def be looking out for this one. Plus I loved seeing how the book has developed along the way! One the most beautiful YA covers! Thanks for the chance! I would love to read Lies Beneath. I've been hearing such nice things about it. Awesome giveaway! The blurb also sounds delicious :) Thanks for the chance to win! I've wanted to read this one forever. I've heard that it's definitely must-read mermaid book of the year! I can't wait to read this one! Thanks for the chance to win!! This book sounds really good. I can't wait to read this one! I've heard so much about this book and it sounds like it's a really great read. Thanks for the giveaway! There are many things in the supernatural genre that have me feeling skeptical, especially mermaids. And yet, every time I see a review for Lies Beneath I start second guessing my skepticism. The story just seems like it's going to be something totally unexpected. I mean, the mermaids I know are beautiful and sing happy songs and are curious about humans. The mermaids in Lies Beneath kill humans! My mind is blown. I am actually looking forward to reading this book! I have read only one book about mermaids so far and loved it. This looks interesting too! I can't wait to read this book! Thanks for the giveaway! I've been wanting to read this one for so long! I think the third and first person differing points of view is very interesting. And seriously what ARE the odds of another YA book with the exact same MC character names!? I've never read a book about a mermaid before. I decided to start with a good one...this one! I hope to read it soon. Loved this book & it was my 1st mermaid one too. Thanks for the giveaway! I love that it is told from the perspective of a merman instead of a mermaid, it just throws the old stories on their heads that much more. What interests me is how a book can go through 4 or 5 titles before a consensus is reached. The author, agents, editors, and any number of people have to air their views. You screw up the name of the book, and even the best book ever written might not get off the shelf. Wow, awesome :D Thank you! I was lucky enough to get an ARC of this, and the book is fantastic! Great job, Anne! Thank you for the giveaway. I had the chance to read an ARC (way back in January!) and I loved it. I can't wait to read the rest of the series. Thanks for the giveaway, looking forward to read this one. This book sounds fascinating. Mermaids are seriously overlooked in the world of fae and in writing. I love all of the new mermaid fiction that's coming out now! So excited to get this book and read it! This book sounds really interesting; interested to see the dynamic between the characters! I'm so happy I found your blog! I can't wait to read all the books you're introducing me to! I have heard some really good things about this book, gotta read it soon. Good idea with the first person point of view. Books written like that often seem more intense - not always - but often. Books about mermaids rock! I cant wait to read this book, the cover is gorgeous. I am such a Mermaid fan! I can't even tell you how excited I am for this book <3 I liked the examples of the First and Third person point of views. I am so excited to read Lies Beneath. I do love stories that involve Mers. Thank you for the giveaway! Never heard about this book. I would love to read is. Thanks for a great give away. I'm so glad you changed from 3rd to 1st perspective because it makes it so much more intimate! Thanks for this awesome insight to the process, and the giveaway! This book sounds amazing! Thanks so much for the chace to win it! I absolutely fell in love with the dark haunting story that this book had to tell from deep below its murky depths of rich glimmering waters. It was so beautifully written that it wasted no time in successfully ensnaring me in its amazing web of secrets, betrayals, and lies. It was just...beautiful! I LOVED IT SO MUCH!!! And I would love to my own copy of it as well. Thank you, so much for this generous and amazing giveaway!! !